Crew member of Apollo 17 (with Gene Cernan and Ronald Evans). Last flight to the moon. Harrison Hagan "Jack" Schmitt (born July 3, 1935) is an American geologist, retired NASA astronaut, university professor and former U.S. senator from New Mexico. In December 1972, as one of the crew on board Apollo 17, Schmitt became the first member of NASA's first scientist-astronaut group to fly in space. the second-to-last person to step off of the Moon (he boarded the Lunar Module shortly before commander Eugene Cernan). 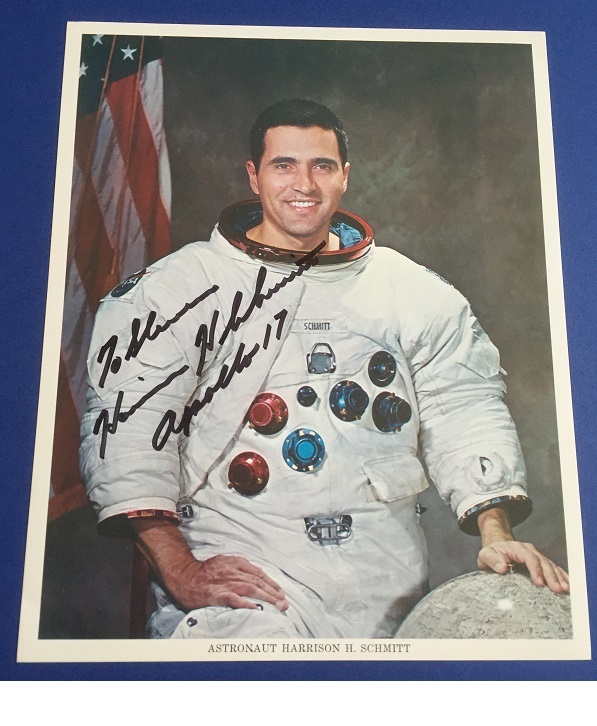 Schmitt also remains the first and only professional scientist to have flown beyond low Earth orbit and to have visited the Moon. had been one of the scientists training those Apollo astronauts chosen to visit the lunar surface. commander Gene Cernan in December 1972. Schmitt claims to have taken the photograph of the Earth known as The Blue Marble, one of the most widely distributed photographic images in existence. that the Moon once possessed an active magnetic field.